This new line is intended for handling the 4 cylinders crankshaft (GME engine) during the different machining phases. 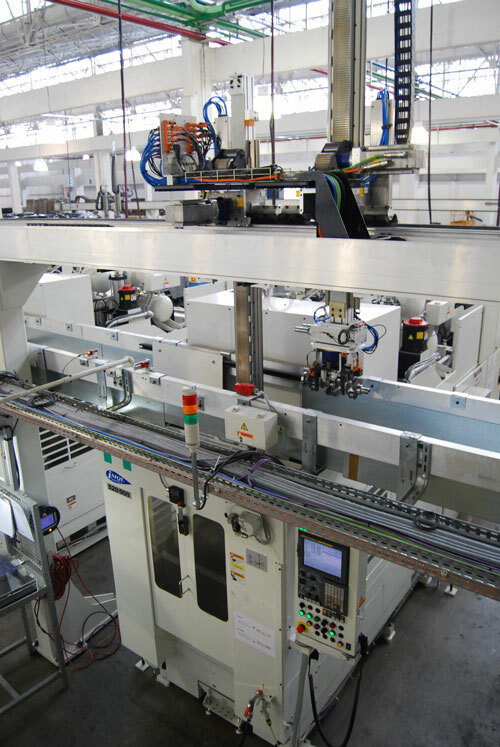 It is composed with 7 gantries of the FG180 range, controlled by Siemens CNC system, and 5 Comau robot cells coming with their PLC controls cabinet. 2 RP11conveyors, a laser engraving station and multiple stocks complete the facility which will have a capacity of producing 200,000 pieces a day. The anticipated delivery of equipment to July 2015, instead of the initial contractual date in September 2015, to produce the first piece end of September 2015, make this project a real challenge for engineering and purchasing department, but also for Fives Cinetic technical team which are already hard at work to satisfy the customer. Fives group reputation as well as the expertise in interlinking of the Automation group guided the choice of Head’s Technical Dpt at Fiat. This order Fiat placed to Fives for its Automation business is the first step of a partnership with this customer.